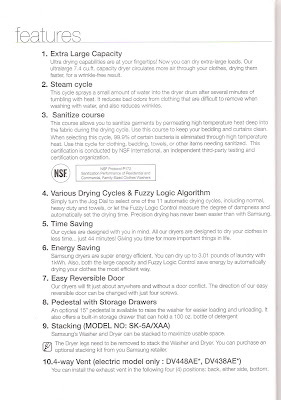 product reviews from a quad mom named suz: Laundry is Now LOADS of FUN! Laundry is Now LOADS of FUN! Congratulations to EMILY with comment #285! You win a $200 Best Buy gift card!!! I would love this machine, but I think I would like the oven that doubles as a fridge. I have no idea what brand it is, but it would be great if I could put something in the fridgoven in the morning when I go to work, and not worry about the food sitting out when it only needs to cook for an hour. What a time saver. Also on the new washer/dryer I noticed you said it had a countdown to completion timer, that would be WONDERFUL! My heart just about jumped out of my chest when BlogHer asked me to chose which brand new SAMSUNG appliance I would like to review (and OWN)! Are you serious?!?!? I made Joe re-read the email over and over to make sure I was translating it correctly. YEP! And YES--SAMSUNG! They dominate at everything else electric, so why not appliances? and dryer (model: #DV448AEP)--complete with pedestals!!! ...and in with the brand, spankin' new! Time to sit down and read through those user manuals (Yes! I am THAT particular and thoroughly read through each and every instruction booklet before setting up new gadgets, don't you?) The booklets were very easy and concise. Click on the image below to view a detailed description of features. 3. Stylish Design- heck ya! Funny how the most exquisite part of our house has now become our laundry room! 5. LCD Display & Center Jog Dial- it is SO easy to use and I love how the screen lights up in the dark as well! Look at all of those different cycles! I also love the countdown to completion. The child lock button will also come in handy with 4 curious kids sneaking in and out of rooms they shouldn't be in! Just press the "Soil Level" & "Signal" buttons simultaneously. 6. Silver Care Sanitation Cycle- 16 million trillion silver (widely known for its antimicrobial properties) ions are released during this particular cycle which does NOT use HOT water---This, in turn, uses 92% LESS energy while killing more than 99.9% of bacteria. - Expensive: From what I have researched, this is the "top of the top of the line" when it comes to washing machines and averages around $1400. This particular washer is among the most highly rated front-loading washers in professional appliance testing (Consumer Reports & Good Housekeeping) and I believe it! It is amazing! - Silver plates must be replaced after 1,000 Silvercare Cycles have been run. If you push the signal button and the silver care button simultaneously, the total number of silver cycles run will be displayed...so it is easy to keep track. 1. Fuzzy Logic Algorithm- What's this you ask? Sensors measure the degree of dampness and automatically set the drying time! Talk about super energy efficient! I love that it automatically shuts off when it detects that the clothes are perfectly dry to the particular level you choose (5 different drying levels: very dry to damp dry) and not a second longer---no more crisp clothes that have been blown to bits! 3. Extra Large Capacity- Again, I am amazed at the amount of laundry I can fit into the washer & dryer! They are HUGE! 4. Refresh or Steam cycle- Say you want to wear something that has been hanging in your closet, smushed and wrinkled---simply throw it in the dryer under "refresh cycle" and it will spray a small amount of water while tumbling with heat. It reduces bad odor and wrinkles! Awesome. 5. Wrinkle Care- It is a button you can push with any cycle-- a small amount of water is sprayed into the drum to release wrinkles from items that have been left in the dryer too long and will continue for up to 90 minutes. I was completely amazed as I pulled load after load out of the dryer and the clothes were hardly wrinkled at all! 6. Rack Dry- Items such as stuffed toys, sweaters, foam rubber pillows, shoes, etc. can be dried on a drying rack so they won't be tossed around. Very COOL! And now, without further adu---are you ready for the contest??? How would you like to win a $200 Best Buy gift card?! "Which Samsung appliance would make your life easier (refrigerator, microwave, range, dishwasher, or W/D)?" - Or you may leave a link to your post on your own blog in the comments below. The contest will begin at 10/5/2009 @ 7pm CST and will end 11/15/2009.....Make sure that the e-mail address you leave is correct! You've got 8 chances to win a $200 Best Buy card. Visit Samsung's site for more information. I love all the pictures you post. The kids watching the delivery man is great!! I'm having a hard time deciding between washer/dryer and refrigerator. I'm leaning toward a fridge, because I'm an organizing freak and my fridge/freezer is WAY too small. I need room! I would say- Washer and Dryer! I constantly leave a load sitting in the dryer too long, and they have to be re-fluffed. It would be nice to finally have a dryer with the right options so my husbands shirts dont shrink to short and fat! I'd love a new fridge! I have been shopping around for a new washer and dryer set, and I would LOVE a new one! Thanks for all the good insight into this brand. I'm drooling over the washer and dryer. So many cool features, and yes it looks like fun. I think the W/D would make my life so much easier! Sorry Suz, but your piles of laundry looked so small for a family of 6! I only have two kiddos, but we could easily do double that in a week! Definetely the washer/dryer! I would love the dryer to use the anti-wrinkle setting. I either put too many clothes in or don't take them out soon enough and I always have to iron. In my dreams I have a dishwasher. I can't believe I have made it through babies and toddlers without one. But I will say I am super jealious of your W/D. They are pretty. It's hard to decide between a dishwasher (ours is SO loud and it isn't doing such a good job anymore) and a new range (oooh, how I want a smooth top one!) We've purchased all of our appliances from Best Buy and have been thrilled with their customer service. I enjoyed reading your review and hope that you love your machines for years to come! I would TOTALLY sat the washer/dryer, I was practically drooling over yours! We have a king sized bed and it is so hard to wash the bedding in my tiny washer. I would also love the refresh and wrinkle cycles on the dryer!! I think the item that would be the most help is a new Samsung fridge. funny side note....my two year old was sitting on my lap while I was reading this. She was pointing at the banner on the blog saying :boy, girl, boy, boy,girl boy, dog: then she said thats a lot of boys! 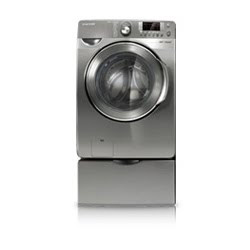 I will now have dreams about the Samsung washer and dryer after reading your review! I could definitely use both! We go through a ton of laundry a week with just our family of three at the moment. With a new baby coming this December, I know that the laundry load will greatly increase! Thanks for the awesome review! W/D!!! I want one of those so bad!! I could use a new dishwasher. Ours has had problems since we moved into this house. Since I live in an apartment, none of them at this moment, but that washer and dryer look amazing! I could definitely store those bad boys somewhere until we get a house! well we just bought a new house with dishwasher, fridge and such so i'd have to go with the w/d. ours are super old (used when we got married 7 years ago) and are probably going to die any day. i would LOVE this w/d set but can't afford to spend that kind of money on it right now. A new dishwasher would make my life easier! I only have one toddler, but somehow we still seem to end up with enough dishes to do a load just about every day. I would love a larger and much quieter dishwasher! I'd be in laundry heaven with the washer/dryer you're now sporting in your house! Oh my goodness, this w&d looks amazing! My family could definitely use one of those bad boys! But a new refrigerator is first on our list and a new Samsung with all of the storage, stylish(like that matters?ha!) and features would be perfect! I have been absolutely dying for a new microwave... we just moved from a house with a fabulous, high-powered built in model to a new house without a microwave. We bought a cheapie at the store to put on the countertop... but it's just NOT the same. Although... I'm not gonna lie... that new washer and dryer looks SO awesome! A new washer/dryer would be great around here! its amazing the amount of laundry there is! 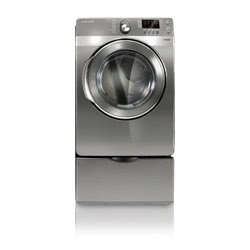 I have done a lot of research on washers and dryers and I absolutely LOVE the ones you have. They are my dream appliances! haha I never thought I would say I have dream appliances! I would have to say this particular stove (http://www.samsung.com/us/consumer/appliances/ranges/electric-ranges/FTQ307NWGX/XAA/index.idx?pagetype=prd_detail) would be an awesome addition to our family! My stove is getting old and the burners "cut out" on occasion. I have to wiggle them around. Plus, the top is hard to clean. This particular stove that I picked from Samsung is fast, enegery efficient, and very smart per se. I enjoyed reading your blog about the new W/D. They are HUGE! Congrats! My e-mail address is kc100607@gmail.com. I'm not sure what I would want most, but I do love that washer and dryer! I actually enjoy laundry and it would be so much fun with those! I would love the washer/dryer! My Harley mechanic husband creates the most ridiculous laundry issues! I would have to say that the washer/dryer combo would be my number one pick right now! Laundry piles up the minute I have just finished folding clean, dry clothes! Well, I would WANT the washer and dryer, but in reality NEED the dish washer. Mine is on the fritz, even though its not too old. Its only running half cycles and turns on and off whenever it darn well wants to! It has a mind of its own these days! Sooooo stinking jealous!!! I have been admiring the washer and dryer for months. You lcky dog! All I get to review is Fertiliaid! LOL! oh ya....washer and dryer or microwave. i would love a new washer/dryer but i think i need a new refrigerator more. mine is way too small and just plain old! Love all your pictures of your sweet kids! I would LOVE a new oven for my new house!!! I definitely think the washer/dryer would make life easier! My husband and I both work full time and we're getting ready to welcome our first baby into the world in the spring! :) We would love a W/D that was large and dependable! The washer and dryer would truly be incredible. I spend so much time doing laundry for our family of 6--well, you get that! I so want the bottom freezer Frig! WASHER & DRYER---those two samsungs are my dream and there are just two of us (right now)!! Would love the washer so I can save water and do less loads. Fridge (RFG297AARS) is definately my favorite, with 3 teenagers, I need a new fridge! However reading your review of the washer/dryer sure makes me want a new one! I LOVE the fridge, but will have to go with the Dishwasher (DMR78AHS) as I don't have a dishwasher and haven't for years. i would say a refrigerator for sure. we moved into a new house with no fridge and a friend let us have her old one from the garage. i would LOVE to have a new to me fridge and pass this one on to someone else who needs one. Holy Mother Load of Laundry! Suz!!!! Woman! You just got to review an APPLIANCE...make that 2 of them. How freakin' awesome is that? So excited for you guys! Awesome review - great details...I'm drooling all over my keyboard! Love you. Can't wait to hear more about the weekend. Tempting, but I'd have to get a fridge! DEFINITELY new washer and dryer! I wish they were done at the same time, I get so tired of waiting for the dryer to be done so I can wash another load :) I need 2 dryers to keep up! We love our Samsung front loaders! We have gone green in our house- saving our money! We have noticed a difference in our electric and water bills because they are so efficient. 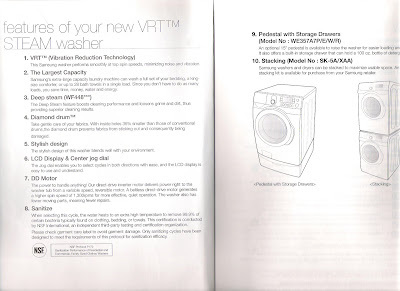 If your readers can't afford these top-of-the-line beauties Samsung has lots of other front loading options that still have great features like the VRT technolody and sensor dry. You can tell I did my research?!?! I had to paint our laundry room a fun shade since the washer and dryer look so snazzy! How great for you and your family, congratulations for your blogging creativity and dilegence being rewarded. A samsung Dishwasher would be great. I am phanatical about clean dishes and a nice, QUIET machine would be great. Without a doubt...washer and dryer. We recently got a new refrigerator and dishwasher, would love a larger washer/dryer for our 5-person household.....including our 6 year old and 2 year old twins. Washer/dryer for sure!!! They are AWESOME! I'm so impressed!!! I would love the refrigerator - the one we have does nothing to excite me about preparing dinner or spending time in the kitchen! I would love a new stove. 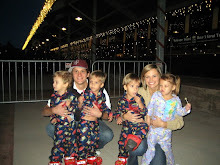 We also are a family of 6 (4 boys ages 1-7) and have a very outdated range. Refrigerator, for sure. Cute post! Um no doubt the washer and dryer!!!! Oh my gosh that washer/dryer looks like something from the Jetsons! We would love a new washing machine, as ours is old, it leaks, and we can't afford a new one right now! well, i "only" have triplets, but no doubt...a new washer and dryer would make my heart go pitter-patter. An extra-large capacity washer and dryer!!!!! With 5 kids I sure do like the size of your new washer and dryer. Although all of our appliances are fairly new - I would pick the w/d for sure. First, your family is precious! Your kids watching the delivery man...too cute!! I would definitely say the washer and dryer. I leave clothes in the dryer way too long after they are done. PLUS I HATE to iron...can't tell you the last time I even got an iron out (thank you dry cleaners), so having a dryer that would get the wrinkles out would save us so much money since most of my items that go to the dry cleaners really don't need to go. I definately would take the dryer. I'm always trying to guess when to take the polos out before they get all wrinkled! I hate ironing, so this would make it all so much easier! Wish I had the dryer! Love all the features! Maybe one day! I would love a new fridge! I would love the washer. I have one that I inherited from my parents and it's been fixed a few times and can't do a large load anymore. So, the extra large capacity on this machine would be great for a family of five. i think a new dishwasher would be awesome. we have an open floor plan and can't run the dishwasher and hear the tv at the same time. I could really use a new dishwasher since we have replaced all the other appliances in the house. One that the little soap dispenser works and that isn't so loud you can't hear yourself think. That would be my top choice. the washer & dryer would totally make my life easier. we are only a family of 3 right now, but our 2nd baby is due in february. i do tons of laundry right now b/c my hubby changes clothes often and my 11 month old is messy!! so i know that the washer & dryer would save me time, money & energy too! i'm super jealous that you got a free one!!!! Oh I would LOVE a washer and dryer that washes that much at once. What a dream. Great review! My email is in my profile. Thanks! A new dishwasher would definately be my choice! One of my racks broke last week. Congrats on your new addition! If I had a combo like that I would actually enjoy laundry. I dream of a front load washer and dryer. Dream. So awesome for you guys. SOOO JEALOUS!!! Suz!! :) I would LOVE to have the Washer/Dryer for our quadtastic laundry! They look amazing! Way to go Samsung for coming up with such great appliances! I'd say a new microwave. I am a student so I got one cheap at a garage sale but its not that good. So a samsung one would be GREAT. Oh how I long for one of those awesome refrigerators with a freezer/drawer on the bottom and double-doors on top! Great review Suz! I want that washer and dryer! Wow! Love your new washer/dryer. It's so pretty! My W/D are older than my oldest son and he's about to be 15! Yup, they need replacing. I wash soccer/football clothes every single day and I'm sure with new appliances, I could save time, energy and $$$$$$$ !! I would love a Samsung fridge! Mine is very old and inefficient, but the Samsung looks great! it's a tie between a fridge and a washer... I just bought a new house that needs both!! How lucky are you! I definitely say washer and dryer by Samsung would be AMAAAAAZING! I'd definitely say refrigerator/freezer! I need more space! It seems like food gets lost in the back of the refrigerator while the items used more frequently are in the front causing me to leave things in there too long! I forget that they are in there and they become spoiled. So wasteful! I would choose the washer and dryer too! That looks awesome! So jealous!! The washer/dryer would by far most benefit me. I also have way too much laundry though no where near as much as yours I would bet. That reminds me-I need to go switch out the loads right now. I would love to have a new fridge that fits more food. With a house of 2 boys were going to need it! Thanks for sharing!!! Enjoy your W/D! I need that very washer and dryer you have!! We have five kiddos (of varying size and age :) and the laundry is INSANE!!!! Just today, I was thinkin' "I need a new dryer"! I would say washer and dryer. I feel like my life is consumed with laundry! If I could cut down on the loads, I would have more time to play with my girls who are 2 1/2and five months. I work forty plus hours a week so I am always looking to save time so I have more family time and that washer and dryer would allow me to do just that! HANDS DOWN a dish washer!! Our current one is old and many dishes require some hand washing after it comes out! Don't you hate that! Samsung Rocks! I want one! YOu have totally sold me!! Now if only I could win that gift card to help us buy one! 3. Things are shrunk because I keep re-washing everything because I forget to get it out on time. You see it is a never ending "cyle." Pun intended. Hooray for you! I know you'll be giving those a good workout! Me? I crave the oven, though I need the dishwasher. Sigh. I would LOVE the washer/dryer! It would be so useful as we get ready to start a family! We sure could use a new washer/dryer combo and this one would fit the bill. It is so good to know that you have it. God does bless us. My life would be easier with a new fridge. Ours is on its last leg. Great Giveaway! I would love the washer/dryer. We have so much dirty laundry. We really need a new washer and dryer- would LOVE to upgrade and not have mildew smelling clothes from our OLD set!! I'm craving that washer and dryer... it would definitely be my pick. Great review! Considering I have been loving my Dawn dishsoap for years I would be in love with a gift certificate to help pay for a SAMSUNG dishwasher -- you are def. right this brand is top of line -- Great Review Suz! We really need a new fridge! Those are some awesome washer and dryers though! I'm having major laundry envy! My choice would definitely be the washer and dryer. Washer and Dryer for sure! With 3 small kids I am always doing laundry and it would be great to have a large capacity to cut out my laundry time! I would have to say a W/D or dishwasher. I am a clean freak, so either of those would be essential for me. I love the post! The kiddos watching the delivery man was priceless! Those machines look awesome! I would love a new dishwasher. After hearing your review, I can't resist! A new washer and dryer! My husband works in the oil field and all those oily clothes have been hard on my washer!! Oooh ooh ooh--definitely washer and dryer! Family of five and cloth diapers say pleeeeease! Those look awesome! Super cute pics. And oof - we have a decent set of appliances now but a decent dishwasher would be great. I love convection ovens as well. I checked out the FTQ386LWUX at one point. A washer and dryer would be faboulosity. You guys should put your blogs into print for the products, you do such a great job! Would love the washer and dryer combo. They are way cool. Definitely the washer and dryer...Ours are struggling to say the least!LOL! Love the pics, your reviews are always so much fun to read! Washer and dryer for sure! Great job on the review! I have to go with a washer and dryer. I have 19 month old twin boys and we have TONS of laundry. Our washer is so bad we have to close the door and the boys are still terrified of the scary noises it makes! I need a new washer! I so want that refrigerator!! The refrigerator. So beautiful and big and modern and energy efficient! A dishwasher that would actually dry everything (including all of the plastic sippy cup pieces), a fridge that would be easy to organize with tons of space, or a top of the line washer and dryer...it is a toss up! OK, our fridge? Makes and dispenses ice INSIDE the freezer. There’s no handy dandy external ice dispenser or water dispenser. We’re talking old school: Plain white with a very small freezer compartment, half of which is taken up with the aforementioned ice maker. We would love love love to have a new refrigerator. I would love an awesome dishwasher!! I would love to have the dryer!! Great Review! I myself would love, love, love a new fridge. Would love a new fridge! A new dryer would make my life sooo much easier! for the last couple of months i have been taking my clothes to my neighbor's house (my aunt) to dry them! ACK! The fridge could teach our 19 year old fridge a thing or two! Would love to have the fridge. I've been applying to every contest I see to win one! Washer/dryer look totally awesome. Congrats! Wow! What a review and awesome gift for you! I would definitelyl ove a new washer/dryer but alas, even $200 won't help with that! But I sure oculd use $200 to Best Buy to get Something! My refrigerator is almost as old as me! yikes. It's time for a new one! I could absolutely do with a new washer and dryer!! Being a college student living with three other girls (who all do 2-3 loads of laundry every other week) and old washers and dryers, our bill is much larger than we wish it to be. With new washer and dryer we would be able to reduce the amount of loads of laundry and with that neat silver care cycle, we would have a smaller utilities bill!! I would love to have the dishwasher! My dishwasher is about to give out I'm afraid. I would say that the washer/dryer would make my life easier. While we are only a family of 3, somehow I think we make the messes of a family of 6. I feel that I am CONSTANTLY doing or needing to do laundry. The washer/dryer we have now are fine but it seems like every load I do is full to the brim. Plus it would be nice to have some extra options for washing instead of just having the options of heavy wash, light wash, and barely get the dirt out wash.
Wow, what an amazing washer/dryer. I would LOVE to have those in my home!! These sound freakin' awesome - wait, I probaby can't hear them because of the VRT! Pick me, pick me randomizer! My life will be easier with the Samsung range!!! I want that rapid cleanser system! Defintely a washer and dryer. I love the smell of fresh, clean laundry!! I'm going to go with a fridge!! Ours has conveniently decided to go out on us and let me just say eating out for every meal gets really expensive! I would say Fridge (RFG297AARS), but you have tempted me with this washer and dryer combo. I think the washer and dryer. I really need the kid proof feature. I can't tell you how many times I walk in to put clothes in the dryer and they are sopping wet because a little one decided they didn't really need to go through the WHOLE cycle. It's a big waste of water to start it over, and I want to conserve everything I can! The w/d would definitely make my life easier. Your review was amazing!!! We're going to start saving money now for a set of our own. New dishwasher to replace my extremely loud one, please!! I NEED a new refrigerator! I would love to have an ice machine that works! I'd love to win any of the above. We'd probably pick a new stove if we had to narrow it down although you're making me jealous with your new washer and dryer! I would love to have the W/D!! I have soon to be 2 year old twins and man that would make life alot easier. My W/D are who knows how old b/c we got them used when we got married 9 years ago. I'm really waffling... The fridge is beautiful, but I feel like I spend my entire life doing laundry, and your new washer/dryer set are so beautiful! Recently, my partner and I purchased our first home in California. Now comes the fun part- setting up our home! As a mother of twins (Boy/Girl) you never run out of laundry- so my vote is for a new washer/dryer. We have been looking - and the Samsung is AMAZING! I am jealous of all the snazzy new features that you spoke of! How great would it be to have something that can get all the grime out of a pair of toddler pants? With twins AND a great dane... we do lots and lots of laundry - so the washer/dryer combo would make our lives so much cleaner... I meant easier! I vote for the microwave. We'll be moving soon and I expect the old one to stay here with new buyers...but if we stayed it would definitely be a new fridge! Definitely that new Samsung dishwasher is what we'd need in this house. Ours is an OLD detachable dishwasher... the spokes are rusting and breaking off... there is not enough room for the dishes of a family of 4... aahhhh... dreaming of that nice new dishwasher now. And you guys are just too darn cute!! I would say the washer and dryer would make my life easier. Our set was the cheapest they make and it is 10 years old. We have to dry everything two times, which takes forever and is expensive. Considering I can go through 20 towels in a DAY during kidding season -- I would absolutely love one of those washer/dryers. WOW! Definitely the washer/dryer. I could really use the steam feature for work clothes that just need refreshing and I've been living with a small, noisy stackable unit for 2 years! Thanks for the cool giveaway. a new fridge would be heaven! Love the pics you posted!!! We would love the fridge! Ours is about 9 years old. We can't put veggies or fruits in the veggie drawers because they will become "icey"! UHG! It also makes our costco trip limited because our fridge is too small for a family of 6! Awesome Washer and Dryer! I want them! I am about to buy a new house so those would be great! The Samsung W/D would be AWESOME in my home! The washer would make my life so much easier. Mine is 12 years old and on its last leg. Wow those are really cool. I think that dryer could change my life. Wow! From Ragu meals to new washer and dryer. WOW! How cool is that!! A new range would make life here even better. We bought a nice new range at our last house, and then promptly moved. We love our new home but the range here is rather puny. A new range would be a great addition to our kitchen. I am OH so jealous! As much as I would love a NEW washer and dryer, a new refrigerator is at the top of my list. Ours is so tiny and the freezer, well is, tiny and has NO drawers for storage. I could definitely use the range. Ours is as old as the house (1985) and doesn't always work quite right.